Author Note: For some reason I can’t get the tables to fit onto the blog page despite several efforts at re-sizing them. I even changed the blog appearance to see if that was the culprit. I decided I like this appearance so I am going to leave it for a bit I hope you enjoy the post. A recent Windsor City Council session peaked my interest as the meeting saw local developers requesting city council for a reduction in the city’s development charges. The crux of the developer argument was that due to the high costs of development charges in Windsor it was not competitive for them to build in the city. For those who are not familiar with development charges are fees that are applied to developers who build a new development in order to help cover the cost of new or upgraded infrastructure to support the project. This idea is pretty straight forward, but in practice it is much more complicated. In an ideal world, these charges would be set at the marginal rate cost of the development impact on the infrastructure and community. In reality large portions even an entire city, town or county are often lumped in under a single charge or a range of charges for different types of developments. So what are development charges in Windsor? 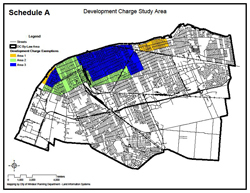 Coloured Areas illustrate different development charges. Yellow: Schedule C; Green: Schedule D’ Blue: Schedule E. This map is taken from the City of Windsor website. I requested an improved map with a higher resolution from the City of Windsor but never received a reply. Lets consider a hypothetical development at the site of the Former Grace Hospital on University Ave. between Crawford Ave. and Oak St. (you may want to switch to satellite view to get the best idea of the scale of the site) which was torn down over the summer of 2013. The former hospital was situated approximately halfway between the University of Windsor and the downtown which makes this a prime location for development. If you assume that the area remains residential in nature and that the new houses are placed on lots of the same approximate size of the houses of the surrounding streets you are likely to get approximately 30-40 homes on the former hospital land. Given its location, the former Grace hospital site would be considered a Schedule D development charge, (by my reading of the map). If you assume that a developer wanted to build 40 detached homes on this land it would cost: 40 X $12,191 + 40 X $591= $503,280 . So half a million dollars would be required to be paid by the developer prior to a shovel entering the ground or house sold. So the question has to be asked do these fees impact development in the City of Windsor? To answer that question you have to know what developers are thinking. Developers are at heart businessmen, Charges in Windsor for detached houses range from $387,760 to $723,880 for a 40 unit development. How does that compare to the rest of Essex County? * Leamington uses two sets of charges depending on whether you are developing in the town itself or in the surrounding rural communities hence the range. In the cheapest jurisdiction, rural Essex county a 40 home development would only cost $331,160 while in the most expensive Town of Lakeshore it would cost $635,840. Both of these costs are lower then the range of costs in Windsor itself. The impact of the above is important for development in the City of Windsor. Andrejs Skaburskis and Ray Tomalty (2001) conducted research on development charges and municipal property taxes and found that these charges do slow development and do not necessarily result in timely construction of new infrastructure. Higher charges also result in increased lot frontages and decrease population densities as building fewer houses with larger lots, is a way for developers to save on charges while inflating housing prices. This is important because of how Windsor has structured its charges. Looking at the map above, you see that schedule C, D, E areas are surrounded by the general charge areas costing $17,792 (for detached housing). This $18,000 charge is several thousand dollars higher than the Towns of Lasalle and Tecumseh, which are Windsor’s immediate neighbours and if developers have the choice between building in Windsor at a higher rate compared to Lasalle and Tecumseh which can save them tens of thousands of dollars by moving development a few kilometers down the road. What do you think they are going to do? This is why it is a little surprising that just this past week (April 7th) after council decided not to reduce development charges the first new condo development in 6 years in Windsor was announced. With starting prices at $114,900, the development will consist of 50 apartment residences and 5 townhouses which is set in the east end of Windsor outside of the special schedule cost areas. It is no surprise that this development is apartments/townhouses which cost just over 1/2 to 3/4 of the charge for a detached house. That being said, the developer is still on the hook for approximately $529,475 in development charges that need to paid before they can start building and it could be a long time before other developers follow suit.